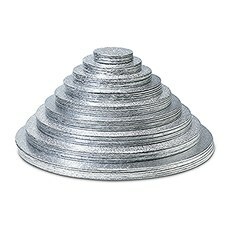 Round and square foil wrapped cake boards and cupcake stands to showcase your wedding cakes and desserts. Although it seems impossible, Weddingstar's cake and cupcake display accessories are designed to help you take your extra-special dessert display from sweet to even-sweeter. These glass jars, cake boards and cupcake stands help create one-of-a-kind cake or cupcake displays for wedding themes ranging from glitzy and glamorous to rustic and down-to-earth, plus every theme in-between. At Weddingstar, you'll find a cake wedding display accessory that speaks to your special design style and sweet tooth, whether you're looking for something large, multidimensional and statement-making or small, dainty and antique.Making your own cake? 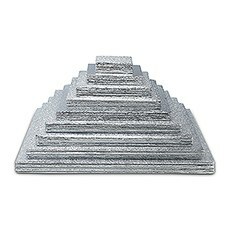 Give it a professional edge with one of our square or round foil-wrapped wedding cake boards. These boards are sold in packages of six, allowing you to create an elegant, tiered wedding cake with plenty of height and dimension. They can also be used to highlight cupcakes and baked goods on the dessert table or as a unique foundation for DIY centerpieces. We also offer cupcake display towers that come with everything you need - minus the cupcakes, of course - for a next-level cupcake sculpture at your wedding reception, engagement party or bridal shower. For a sweet, miniature display for favors and dessert buffets, check out our bell jars that can be used to house cupcakes, cookies and more.Why shop Weddingstar for all your wedding-related needs? We provide the best selection of hand-picked gifts, favors, stationery, decor and more to ensure that every bride and groom finds items to match their special theme. With low prices, volume discounts and bulk purchasing available, Weddingstar can help you execute your dream wedding on a budget! Make sure to shop our complete selection of wedding cake accessories to find sweet add-ons like cake serving sets, cupcake wrappers, cake decorations and more sweet dessert essentials.